Roll Forming Mill, the main part of roll forming line. This post, i will introduce one lind of Cold roll forming mill type: Cantilevered mill. Which is a very simple roll forming mill type. manual or economical. BELI® is a Roll Forming Line Factory and coil process equipment factory in Wuxi, China. The cantilevered mills support the shafts at one end only; hence, they are sometimes called“overhanging” or stub-type mills. Singular adjusting screw makes it difficult to set the required roll gap. Double-adjusting screws makes it very difficult to adjust the shafts up or down, while keeping the top shaft parallel to the bottom shaft. The deflection of the two opposing shafts under the same load is approximately four times the deflection of the same shaft supported at both ends. Owing to the larger deflection of the cantilevered shaft, the shaft length (and the maximum formed width) is limited. 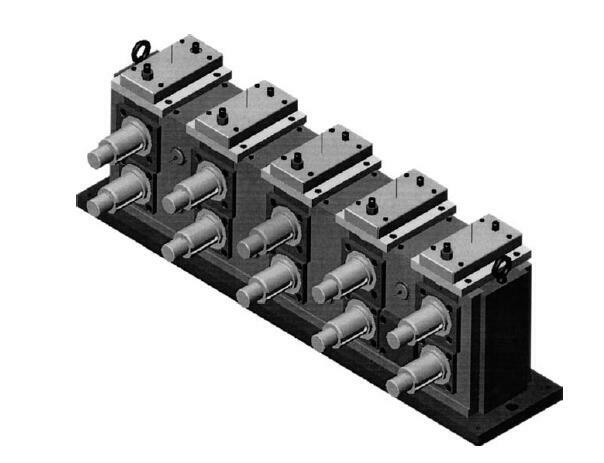 To facilitate fast profile changes, rafted (plated) cantilevered mills have been developed. The plate, supporting the stands, shafts, and tools, can be lifted off and exchanged with another one within a few minutes. Next post, i will introduce another roll forming mill type. Duplex Mill, which have one common base and drive. They can form both edges of narrow or wide products leaving the center flat. The minimum strip widths depend on how close the opposing rolls can be pushed together. And the maximum widths usually depend on how far the two mills can be moved from each other. .. Roll Forming Line Factory(BELI) SUPPLY. BELI®(Roll Forming Line Factory) have series kinds of roll forming machine design for different demands. Such as: Roofing Sheet Roll Forming Machine, Wall Cladding Roll Forming Line, IBR sheets Roll Forming Machine, etc. Contact us now.